The (hard) rock genre always knew not only to hype its guitar heroes, there were also always drummers that made it to super stardom. It all started in the Seventies with the late John Bonham and Keith Moon, continued with the decade-spanning success of Neal Peart and is still alive and kicking with the likes of Mike Portnoy. 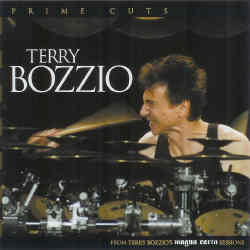 And where does that leave Terry Bozzio? Most casual rock fans will not be that familiar with this person, although I think I can remember having an old Frank Zappa vinyl album from the Seventies where a young Bozzio started as a kind of drummer wunderkind. This here compilation collects Bozzio recordings that he has done solo or with projects (I dare not call them bands) on the well known prog rock label Magna Carta. Prime Cuts starts with the previously unreleased Sick Jazz Surgery, a courageous ten minute long jazz piece with interspersed synth sounds, close to the more experimental jazz rock of the Seventies. The following Dangerous is from an album he recorded with Tony Levin (King Crimson) and Steve Stevens (Billy Idol), starting like Led Zeppelin's Immigrant Song before turning into a more angular, crimsonesque rock rhythm. Dreaming In Titanium is from a Jordan Rudess solo album, necessarily heavy on keyboards, but again with Bozzio's self confident drumming as backbone. Last Call from Explorers Club is the only real band song, clocking in at 11 minutes, an ideal piece for the more traditional prog fan, with Dream Theater's James LaBrie on vocals. The second half starts with another unreleased song of a Bozzio Levin Stevens session, without Stevens and ultimately forgettable. A Glimpse Into A Deeply Disturbed Mind is another drum solo song, unlike what you hear rock drummers perform during live shows. Bozzio is very proficient when it comes to do skilful percussion and borrowing from the jazz and 20th century classical music genres. Edge Of A Circle is from an album Bozzio recorded with Billy Sheehan (David Lee Roth), an astonishingly straight forward rock song, with vocals from Bozzio himself, showing us that he is actually a more accomplished drummer than singer. The album ends with a remix of a Bozzio Levin Stevens song by Vapourspace, transforming the progressive sound of the original into a surrealistic soundscape. Prime Cuts is not just another compilation, and by showing us Bozzio's work from very different angles, it's definitely not an easy listening album. That's what makes it interesting though, aiming at a tolerant audience that loves prog rock, jazz and contemporary music. As a compilation, it could be longer, but apart from that, it's one of the most refreshing retrospectives I have stumbled over in recent times.